I’ll start this off by saying that yes, I’m very well aware that I’ve been dormant for over a year now. That aside, I’ve decided to take my first stab at reviewing a smartphone, in this case the Sprint version (Epic Touch 4G) of the Samsung Galaxy S II. Let’s begin. Prior to buying the Galaxy, I owned an EVO 3D. As a result, when I opened the box, I was amazed by how thin and light the Galaxy is considering the huge horsepower packed into the device and how big it seems. As for the choice to use plastic instead of higher end materials, it didn’t really bother me as much as other reviewers have mentioned even if it does slightly reduce the “premium” feel of the phone. I already managed to drop it once and it seems to have survived just fine which means the plastic may actually be more durable and perhaps less scratch prone than it may initially seem. One thing that concerns me is the camera lens. Unless you have a case that gives the Galaxy a little more girth, resting it on top of any surface means running a risk of potentially scratching the lens or the flash. Considering the amazingly great pictures this thing produces, you most certainly do not want to take such a risk. Having owned two phones in the past that had 4.3″ inch screens, the shift to an even larger screen was welcome. If you’re coming from a device like the iPhone, the difference is staggering. That screen size works out perfectly once you’ve seen it in action. Sure enough, the vividly sharp colors and deep saturation on the Galaxy S II make for an absolutely captivating initial experience, you’ll definitely receive some colorful adjectives (pun intended) when showing it to friends and family or even strangers. One thing that’s been noted in other reviews is the fact that the resolution is only WVGA. Again, having used an EVO 3D which has a qHD screen, I can somewhat understand how such a screen would seem underwhelming on such a high end phone. However, the stunning color saturation more than makes up for the fewer pixels. In fact, I’d say the average person won’t really notice a difference. I’ve read less than glowing reviews for Samsung’s TouchWiz custom user interface. As a longtime HTC user prior to going Samsung, it’s definitely underwhelming when compared to the slicker, aesthetically pleasing and much more functional Sense interface. TouchWiz is missing some widgets that I’d grown very fond of, like the Favorites and the Friend Stream for staying on top of my Twitter and Facebook stream. I was able to find a sort of TouchWiz equivalent for Favorites with something called Buddy Now but I found it cumbersome and nowhere near as easy to use (or pretty) as what’s on Sense. A killer app that neither Samsung nor Sprint seem to be highlighting as much as they should is Kies Air. Using it, you can easily (and securely) transfer and view files, text messages, pictures and pretty much everything else on your device wirelessly to your PC or Mac just by typing an address into a web browser. It’s a hugely improved experience compared to the typical Android method of connecting your phone and switching to USB mode. The phone has Android 2.3.5 which includes the video chat via Google Talk. One thing that has kept me far away from owning a Samsung smartphone is the shall we say…spotty history when it comes to Android updates. Although there’s no guarantee that Samsung has gotten its act together in terms of timely updates, I’m hoping things will turn around when it comes to the Galaxy S II. Still, it’s something worth keeping in mind if you’re looking for a phone that will receive updates on a reasonable timeframe. As for performance, the Galaxy S II is a swift beast. Having used it for a week now and having thrown graphically intensive games at it and opened numerous apps at the same time, I have yet to experience any type of slowdown whatsoever. You’ll definitely notice the prowess of Samsung’s custom processor at work on this thing. Finally, calls sounded nice and clear thanks to what appears to be a pleasantly loud earpiece. I’ve yet to experience any dropped calls or poor signal when out and about. The people I’ve spoken with said I sounded clear as well so there’s little worry in that department. One thing to note: I’ve read about an issue affecting many users of the Epic Touch that requires completely restarting the phone in order to re-establish a lost signal. I haven’t experienced this problem but again, it’s something you may want to be aware of. The Galaxy’s camera and its accompanying app were also wonderful surprises. The eight megapixel camera took some truly impressive high quality photos, even better than the camera on the original EVO which I had relied on numerous times as a convenient point and shoot replacement. I haven’t tried watching the 1080p video I shot on a larger screen such as an HD television but I can tell you that it looks incredibly crisp and fluid on the phone. Although there’s isn’t [yet] a replacement for a full fledged point and shoot, I’d say the camera is a great alternative. The camera fires up fast (thanks to that aforementioned processor) and the time between pressing the shutter button and snapping the photo was also very minimal. Those of you who like taking various types of photos will also be pleased with the amount of scenes and options available, there’s even a great panorama mode. With a device as large as the Epic Touch, you’d think that the battery life would be dismal. Yet again I was surprised by how much juice the phone has. After a full day of using it to check social networks, make calls, play games, take pictures and read news, I still managed to have about half battery remaining. Your mileage may vary depending on the signal quality and whether you fire up 4G (I’ve yet to bother with it) but this phone should last through a signficant amount of usage. 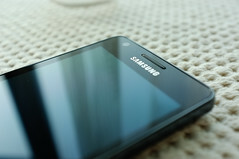 The Samsung Galaxy S II Epic 4G Touch (whew!) is one of the best phones you can buy right now if you’re a Sprint customer. The svelte design, eye popping screen, great call quality and superb camera make for a killer device. If you can overlook the underwhelming TouchWiz interface and don’t mind having to wait potentially several months to get updates like all the other cool kids, it’s a winner.